Blueberry - Are You Ready for a Change? Aging: Aside from genetic factors, for which there is no apparent solution, and we consider the effect of free radicals on aging as the main cause of various symptoms, then blueberries bring you the brightest ray of hope for staying young. These “superfood” berries are packed with antioxidants and rank number 1 in the world of antioxidants. This is mainly due to presence of Anthocyanin, a pigment responsible for the blue color of the blue berries. The abundance of vitamin-C is also a big factor for this impressive claim as well. You can prevent signs of aging like wrinkles, age spots, cataracts, osteoporosis, hair loss, dementia, and Alzheimer’s disease by eating blueberries and getting the most out of the antioxidant potential! Urinary Tract Infection: The formation of certain bacterial colonies like b-coli along the lining of the inner walls of urinary tract is responsible for this infection. It results in inflammation, a burning sensation during the passage of urine and other complications. For this condition, blueberries can be surprisingly beneficial. It has a compound formed of large, polymer-like molecules which inhibit the growth of such bacteria. It also has certain antibiotic properties which add to this effect. These heavy molecules scrub these bacteria off the walls along the tract, thereby preventing the infection. So far, this compound has only been found in cranberries and blueberries. Eye Care & Macular Degeneration: Blueberries are one of the best alternatives for spectacles, contact-lenses, eye-drops, medications and eye surgeries. They can prevent or delay all age-related ocular problems like macular degeneration, cataracts, myopia and hypermetropia, dryness, and infections, particularly those pertaining to the retina, due to their antioxidant properties. Macular degeneration is a serious problem where the retina of the eye degenerates gradually, ultimately leading to complete or partial blindness. I am certainly not telling you to put blueberries in your eyes, but you can simply eat them for healthier vision. Blueberries contain special groups of antioxidants called carotenoids (lutein, zeaxanthin etc. ), flavonoids (like rutin, resveritrol, quercetin etc. ), and other antioxidant compounds like vitamin C, vitamin E, vitamin A, selenium, zinc and phosphorus, which are all very beneficial and essential for ocular health. Brain Function, Memory & Alzheimer’s Disease: Again, the antioxidant properties of blueberries come into play. The anthocyanin, the selenium, the vitamins A, B-complex, C and E, zinc, sodium, potassium, copper, magnesium, phosphorus, manganese and all the others can prevent and heal neurotic disorders by preventing the degeneration and death of neurons. These essential nutrients also protect brain cells and help to restore the health of the central nervous system. It is hard to believe that these berries can also cure serious problems like Alzheimer’s disease to a great extent. They even heal damaged brain cells and neuron tissues to keep your memory sharp for a very long time. Constipation & Digestion: While the roughage (fiber) in a couple handfuls of blueberries prevents constipation, the vitamins, sodium, copper, fructose and acids improve digestion by stimulating the correct gastric and digestive juices to move food smoothly and safely through your gastrointestinal system. 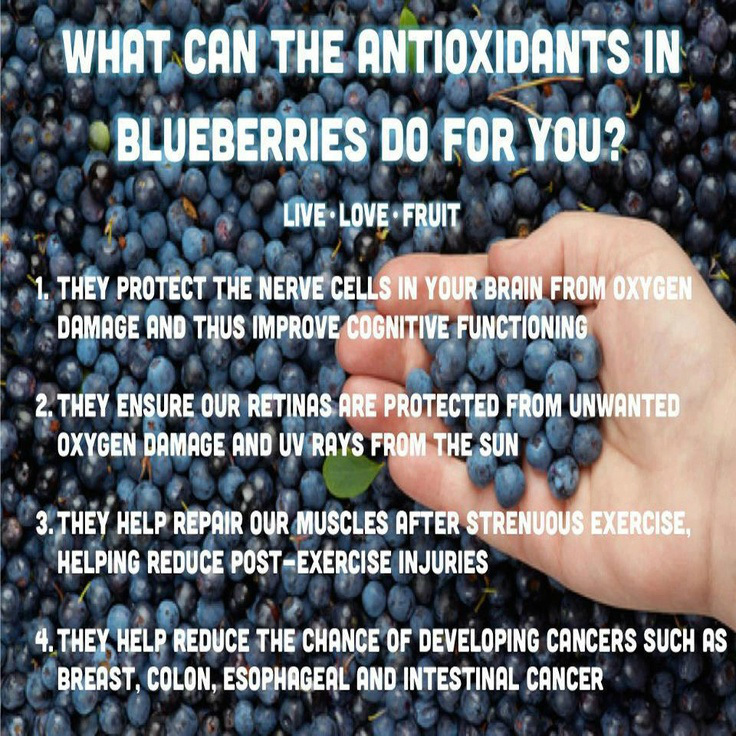 Cancer: Blue Berries can prove to be extremely valuable for cancer patients, for they contain certain compounds like Pterostilbene (an excellent remedy for colon and liver cancer) and Ellagic Acid which, in harmony with Anthocyanin and other antioxidants like vitamin-C and copper, can do miracles to both prevent and cure cancer. Heart Disease: The high fiber content, those brilliant antioxidants, and their ability to dissolve the ‘bad cholesterol’ makes blueberries an ideal dietary supplement to cure many heart diseases, while also strengthening the cardiac muscles. Immunity: Blueberries, being very rich in antioxidants like Anthocyanin, vitamin C, B complex, vitamin E, vitamin A, copper (a very effective immune builder and anti-bacterial substance), selenium, zinc, and iron (promotes immunity by raising hemoglobin and oxygen concentration in blood), it can seriously boost your immune system and prevent infections. Other Benefits & Facts: Blueberries keep you feeling fresh, active, fit, sharp, close to nature and in a good mood, as they are very good antidepressants. You also won’t need to spend a lot of money on medicine, because blueberries are effective against so many different conditions. There are also no negative side effects associated with this “superfood”. A final interesting thing to know about blueberries is that the deeper the color of the blueberries, the richer they are in antioxidants and other medicinal nutrients.